When you’re shopping for a battery, your needs are simple. You want something you can count on to start your motorcycle or ATV every time you want to ride. The best motorcycle battery is a reliable one. Once you start looking for a battery, you realize things can get a little more complicated. Finding a battery that fits your vehicle and gives you enough power can be tricky. With so many different brands of batteries out there, it can be hard to tell which ones to trust. 4.1 1, What kind of batteries do motorcycles use? 4.2 2, Does a motorcycle battery charge while riding? 4.3 3, How long do AGM motorcycle batteries last? 4.4 4, How many volts is a typical motorcycle battery? We’ve done some of the legwork for you here and picked out our 10 favorite motorcycle and ATV batteries. Check out the full reviews to help you find the right one for your ride. When you consider this battery could last you over ten years, the high price is less jarring. This is a great long-term power option for any vehicle in your garage. It’s arguably the best motorcycle and ATV battery if you’re willing to spend the money. Sometimes only a premium battery will do. If you need the maximum motorcycle battery voltage, you’ll find it here. Now we’ll admit it: premium does mean expensive, but it also means powerful. 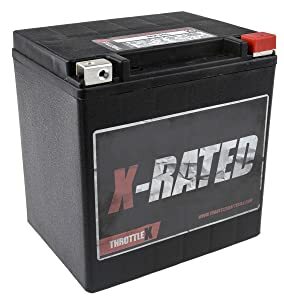 For big bikes like Harleys, few other batteries can cut it like ThrottleX. The construction and material quality are absolutely top-shelf here. It has reinforced terminals and the cover is heat-sealed to prevent operational damage. Inside, the glass mats have full frame plates to protect them, reducing the discharge rate. If you don’t need anything super-powered, this little battery might be just what you’re looking for. 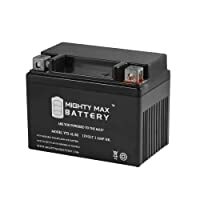 Batteries can be heavy and expensive—and that’s where Mighty Max comes in. At right around twenty bucks, it’s definitely affordable. It also has very compact dimensions and weighs less than 5 pounds. This makes it one of the most portable 12v batteries on the market. The only downside to this low weight is that it’s correspondingly low-powered. It has the lowest capacity of any battery reviewed here (3 Ah). This means it won’t last as long between charges as most of the batteries here. Having said that, it can reliably start and run engines up to 120cc’s without issue. It also works just as well in small watercraft like jet skis as it does in bikes and ATVs. If you don’t need anything super-powered, this little battery might be just what you’re looking for. If you’re looking for good power for your motorcycle in cold weather, Chrome Battery should be prioritized. It has 200 CCA, 250CA, 12ah, and 18 mins of RC. We’ll start things off with this versatile little battery from Chrome. It’s a direct replacement for the battery in a lot of motorcycle models, especially Japanese brands like Honda and Kawasaki. It’s not too heavy or pricey, either, making it a convenient choice. This is a rugged, durable battery that’s ideal for off-roaders. It won’t be damaged by even extreme vibration. If you’re careful with how you discharge it, it’ll last you for years. You can recharge it over 2,000 without failure. The only thing this battery doesn’t do well is extreme temperature. It’s not the best option for snowmobiles and other winter vehicles. It doesn’t put out nearly as much power once the temperature drops under freezing. The rest of the year, though, this is a great high-performance ATV battery. Power Sport batteries from ExpertPower are a no-frills option for affordable performance. 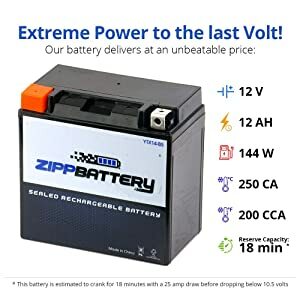 This battery is a great value at less than thirty bucks. It gives you 10 hours of continuous use per charge. It can give you that same power in cold weather, too, making it a great all-year battery. At a slim 6 pounds, this lightweight AGM battery is easy to take with you anywhere. It functions best in float uses compared to deep discharges and recharges. The cold weather performance is high, too. You’ll reliably start all your vehicles even when it’s 20 below using the ExpertPower ETX9-BS. Durability is a big concern for ATV batteries. This battery won’t be damaged by vibration and you can mount it any way you’d like. In the right conditions, it can last you up to 5 years. This makes it both versatile and reliable for all types of vehicles. 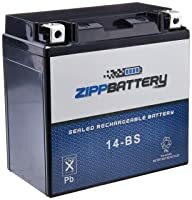 Without a doubt, this is the best motorcycle/ATV battery in the budget price range. You can use it on motors as high as 750CC. 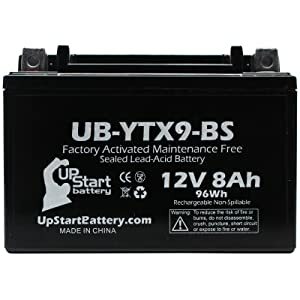 Budget-minded buyers will definitely want to look at this lead acid battery from UpStart. Firstly because it’s the most affordable option on the list. It’s also a great choice because it performs better than batteries that cost twice the price. Our only complaint is about its long-term durability. It won’t take as many charges as more expensive batteries. The terminals also don’t feel as solid, especially for users whose batteries take some abuse. 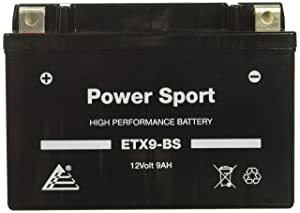 Without a doubt, this is the best motorcycle and ATV battery in the budget price range. You can use it on motors as high as 750CC. It fits well into most Japanese motorcycle engines and performs even better than we expected in cold weather. As a completely sealed unit, it’s also convenient and easy to install. With an 18 Ah capacity, even the most souped-up motorcycle can run on this battery. It might be more than you need for ATVs and other vehicles. 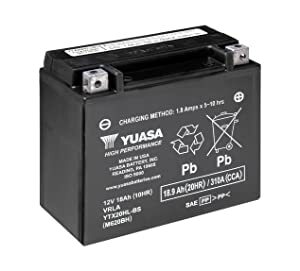 Yuasa is a leading name in high-end motorcycle batteries. Their batteries aren’t cheap, but the expense is worth it if you want reliable power. For larger bikes with bigger motors, this is the 12v rechargeable battery you want. These Yuasa batteries are shipped dry. The plus of that is you’ll know the plates are brand new—no worrying it’ll be DOA. The disadvantage is you’ll need to fill and charge the battery before you can use it. It’s easy to fill and charges fairly quickly, so this won’t be a problem for most people. With an 18 Ah capacity, even the most souped-up motorcycle can run on this battery. It might be more than you need for ATVs and other vehicles. For consistency and power, though, it can’ t be beaten. This battery is durable in terms of withstanding the rigors of the road. It’s resistant to vibration damage, weather damage—pretty much anything a bike or ATV battery will face. Here’s another pocket-sized rechargeable battery that packs a lot of punch. It’s about half the size and power of the Chrome YTX14 above (and about half the price, too). 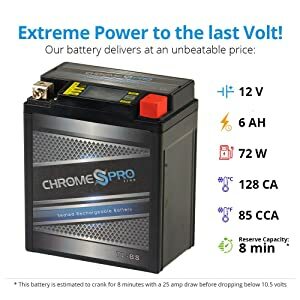 If you want the performance Chrome Pro but don’t need that much power, this is your perfect battery. This battery is durable in terms of withstanding the rigors of the road. It’s resistant to vibration damage, weather damage—pretty much anything a bike or ATV battery will face. It doesn’t stack up quite so well in the long term. Even in ideal conditions, you’ll be lucky to get 3 years of use out of this battery. The Chrome YTX7L has a lot of power for its size. It won’t start a massive Harley in the middle of winter, but for smaller bikes, it’s consistently reliable in every season. Extras like the on-battery voltage display are a nice touch, too. It’s one of the best options for high-powered snowmobiles and other cold-weather vehicles.. 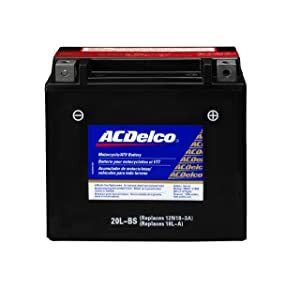 This ACDelco battery is another of the more powerful options on the list. Not only does it have a capacity of 18Ah, but it’s also designed to withstand extreme temperatures. That makes it one of the best options for high-powered snowmobiles and other cold-weather vehicles. ACDelco ships the ATX20LBS dry, so it’s not one you can instantly install. This is another point in its favor for winter warriors, though. You can buy it in summer and store it until winter without any capacity loss or risk of sulfation. Our only qualm with this battery has to do with the design of the terminals. They’re unthreaded and the positioning makes them tricky to work with. This is especially true if your battery’s in a tricky spot, like under the seat. Aside from this small issue, though, this is a solid battery all around. 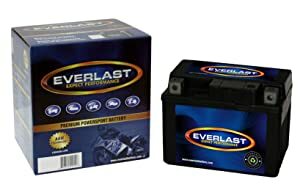 This EverLast battery makes a great replacement for scooters and ATVs, and even some motorcycles and personal marine craft. Smaller recreational vehicles don’t need all the power you’ll get from most 12v batteries. This EverLast battery makes a great replacement for those vehicles. This includes scooters and ATVs, and even some motorcycles and personal marine craft. As a dry-shipped battery, this EverLast can be stored for a long time before you start to use it. Once you fill it, it holds its charge quite well. Just because this isn’t as powerful don’t think it’s made cheaply. The lifespan of this battery can be over five years, on par with much costlier options. EverLast batteries are aptly named. It will start every time even if you don’t use it every day. Don’t expect it to start a hog, but for smaller vehicles, it’s just about perfect. This is a well-built AGM battery with a high material quality and good power for the money. Finally, here’s one to file under hidden gems. 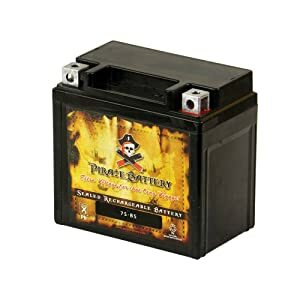 You might not expect much from a brand called Pirate Battery—and you’d be mistaken. This is a well-built AGM battery with high material quality and good power for the money. The build is what impressed us about this model. It uses a lead-calcium alloy construction with copper terminals. Ultrasonic metal welding is used on the case to increase its resistance to shocks, heat, and movement. This isn’t a great option for long-term storage. The self-discharge rate is a bit higher than we’d like—it’s best for vehicles you’ll be using often. With that minor caveat, it’s definitely an excellent value. There are a lot of different factors at play when it comes to choosing the best battery. What type of vehicle you’re powering and how you plan to use it are both important questions. Not everyone’s power needs are the same, and your choice of battery should reflect that. Generally speaking, sealed batteries (like the ones reviewed here) will be the preferred type for most users. They’re easy to install and don’t need on-going maintenance. Since they can’t spill or leak, they’re also safer to use and store. If pressed to pick just one, the ThrottleX MX30L would be our choice for the best motorcycle/ATV battery. It’s a powerful and reliable battery for any motorcycle or sporting engine. Its only flaw really is that it costs more than some people want to spend. Hopefully, this has told you everything you need to know about motorcycle batteries. Now it’s time to choose your top pick and get out on the road. 1, What kind of batteries do motorcycles use? There are a few styles of battery that you can use in a motorcycle. A lead acid battery or wet cell battery is the most convenient option. These batteries will need to be topped off with distilled water from time to time to maintain the electrolyte balance. A dry cell battery or sealed lead acid battery (SLA) is another common style. These are popular because they don’t require maintenance. In fact, they’re completely sealed, and you shouldn’t take off the cover to check the acid level. Absorbed Glass Mat or AGM batteries are a type of dry cell battery. They use fiberglass mats soaked in battery acid to provide the charge. Along with being maintenance free, they’re more powerful and are capable of deep cycling. There are other types of motorcycle batteries, as well. Gel acid batteries are similar to dry cell batteries in that they don’t require maintenance. You can even get a lithium motorcycle battery, which can be a lightweight alternative to more conventional types. 2, Does a motorcycle battery charge while riding? Yes, it does, The battery in a motorcycle functions in basically the same way as a battery in a car. Its primary purpose is to start the engine. While it may also provide some extra power along the way, the engine does most of the work. While you’re riding, the battery will be charged by the alternator. The alternator’s output increases with the engine’s RPMs. This is why idling drains the battery while riding charges it. 3, How long do AGM motorcycle batteries last? 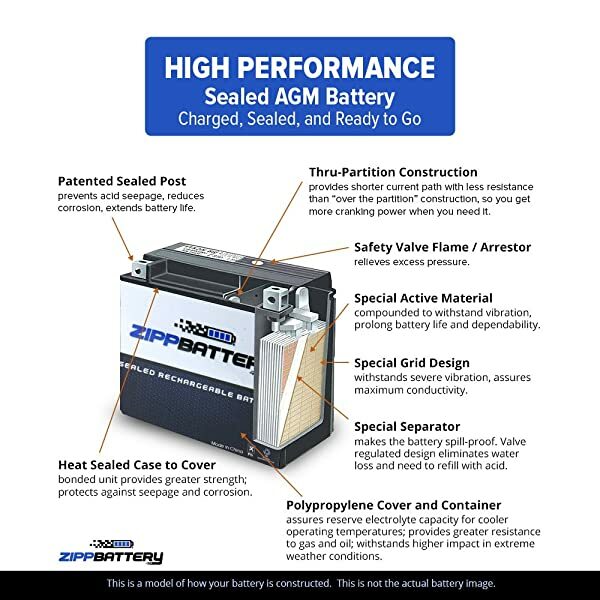 On average, you can expect an AGM motorcycle battery to last around 3-5 years. You can increase this lifespan to as much as 8-10 years with proper maintenance and use. Conversely, this lifespan can decrease if the battery is discharged too deeply, too often. Keep in mind that this is the lifespan of a filled battery. The plates inside won’t start to deteriorate until you add the battery acid to them. If you want to store a battery long-term before use, buy it dry and fill it just before installation. 4, How many volts is a typical motorcycle battery? All motorcycles use a 12v battery, but this is more a description of the style of a battery than it is a definitive voltage. Like with any battery, the actual voltage will fluctuate with use and over the life of the battery. At rest, a well-functioning 12v battery can register anywhere from 12.5v-13.5v. If it drops under this, you may have some difficulty starting your engine. Once the voltage drops below 12v, the battery is functionally dead.